The Short Course Evening Art Club 2019 has now commenced and is no longer taking bookings. If you would like to be informed when bookings reopen in the future, please contact Kay May, Director of External Affairs, via km@soton.ac.uk. An exciting new evening art club for budding young artists aged 13-16, taking place on Tuesday evenings from 6.00-8.30pm. Make new friends and learn new skills in the subjects you love! 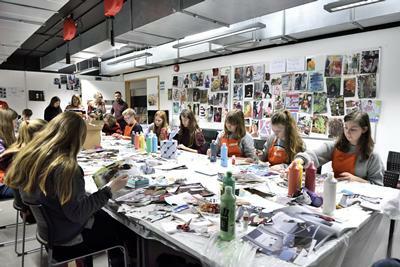 Whether you are a talented artist, or if you have never experimented with art, Winchester School of Art’s evening art club is run by arts professionals who will teach you exciting new things in a vibrant, highly-ranked art school, part of a Russell Group university. Work towards your Gold Arts Award, worth 16 UCAS points, or find out if you could study art and join the successful and growing creative industries earning billions for the UK economy. Whatever your goal, you will enjoy photography, painting, clay modelling, weaving, and making videos among many other things. There are only 22 places available on the Evening Art Club, so sign up as soon as possible, encourage your friends to come too, and we will look forward to seeing you in January! The Evening Art Club runs every Tuesday from 6.00-8.30pm, for ten weeks between 8th January and 19th March, excluding Tuesday 19th February. A fun, light-hearted session, using paint to create a collaborative piece of artwork. 15th January - What is Video Art? Exploring artists that have used moving image from early abstract film to present day. Working in groups to discuss what we have observed and learning some signature video-editing techniques. Clips gathered on iPhones will be worked into using video-editing tools and techniques we have learned to form a series of short videos which will be shown in a lecture theatre. Design and experiment with weave techniques. Creating an artefact to take away or continue at home. Exploring ways that we can use light to create works of art. Photograms, cyanotypes and long camera exposures. Exploring the possibilities of clay, working with hands, later introducing found tools from the kitchen drawer and creating small units. Using found images and objects to explore ideas around buildings and architecture. 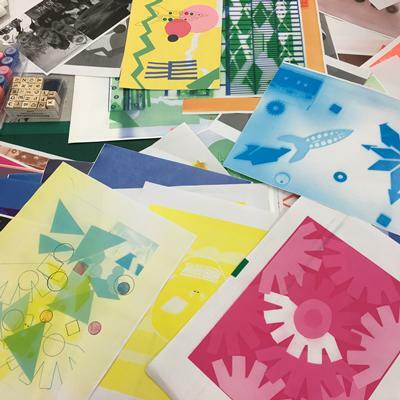 The process of designing in a team to create books, magazines and posters, and printing on the Risograph printer using coloured paper and the ‘Riso’ trademark fluro inks. An experiential session, considering the effects that objects and possessions have on us. Write about your object, draw it, paint it or make a performance about it! Developing observational skills - drawing with charcoal leads to drawing with wire and cardboard and back to drawing with ink. The WSA Evening Art Club is booked via the University of Southampton online store, however booking is now closed for this term. Please contact Kay May, Director of External Affairs, via km@soton.ac.uk if you require any further information. You will be required to complete some basic information about the attendee when completing your booking. Please note, we may also ask you to complete some additional forms before the club commences, including but not limited to: medical details, pickup/drop off details and photography permission forms. The Evening Art Club fee is £275 and includes all of the materials you will need for the club. The fee is paid directly via the online store.